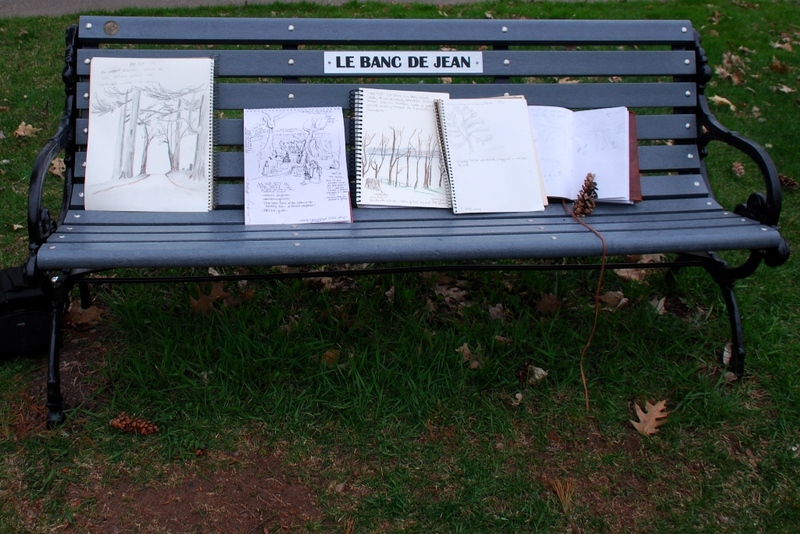 As you may know, since February, I have been leading a drawing class series entitled "Nature Drawing in Quebec City." 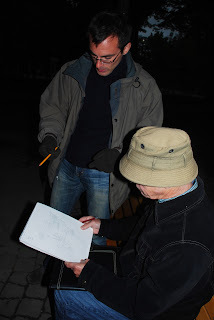 We have been meeting once a month, and have focused on basic drawing skills and techniques which are useful for sketching outdoors, en plein air. Because we are in a city, we are obviously also grappling with how to satisfactorily incorporate buildings, etc. into our sketches. while waiting for a benefit concert to begin in Vieux-Québec. Prior to starting this series, I hadn't drawn much in the entire year-plus that we had been living in Québec. I also had never led a class specifically billed as an "art" class before, despite years of teaching about field journaling and all sorts of other things. My motives for the series were threefold. I wanted to motivate myself to resume sketching, as a way to chronicle our experiences here, and as a way to engage more personally, physically in this city. I wanted sketching here in Quebec City to play the role my field notebooks did in Montana. I wanted to resume using this process to focus on and synthesize new ecological and cultural information. I often find myself enjoying exhibits of sketches and watercolors of local landscapes and cityscapes, all the while thinking, "If I were more disciplined, I would be doing this, too." I wanted to do more of "this," and I was definitely out of practice. I wanted to find out if there were any like-minded folks in Quebec City. I hoped to meet people who were intrigued by the intersection of ecology, culture, and architecture that we encounters in urban environments, and who were driven to record it with pen, pencil, and paints. Two of my students, discussing a sketch. I had no idea if anyone would join the class. I wondered if perhaps everyone who signed up would be more experienced and skillful, or more precise, or more inventive, than I am. Happily, people came, and they come from a range of backgrounds, skill levels, and interests. Throughout this series, I have discovered that teaching drawing skills en plein air is both challenging and rewarding - similar to teaching anything. This is distinct from teaching field journaling, which I have done a lot. However, the two are not mutually exclusive, and we did a whole session on making field notes. The experience has also confirmed how much I enjoy adult education. I love the satisfaction of sharing a skill with someone who is personally pleased to be building their own repertoire. As is to be expected, this series has been a mutually informative lifelong learning experience. during a session in Mt. Hermon Cemetery, Quebec City. Even better, the class has evolved into a loose-knit group of folks interested in meeting to sketch together occasionally, at various locations throughout the city. Recently, a couple of us joined artists working in public at fundraiser for the local English-language hospital. Next weekend, we will be gathering at the riverfront, to sketch the ships and sailors present during the annual Rendez-vous Naval de Québec. a recent afternoon tea and public art fundraiser event. If you live in Quebec City, or are here visiting, you are more than welcome to join us. If you are curious, feel free to take a look at the site I've started in order to coordinate this project: Drawn to Québec. And, you guessed it...now that I am sketching again regularly, I plan to share more posts with scribbles and musings about life in Quebec, as seen through the lens of a sketchbook. It has been great to re-learn the lesson that recording life through a sketch is a meaningful and distinct sensation from that of taking a photograph.